modern convenience, these high tech smart home products are the best WiFi plugs that work with Alexa Echo Dot. These wifi socket outlets are smart home plugs that work with Alexa systems such as Amazon's Echo Dot 1st & 2nd gen.
⭐ Wireless, NO HUB Required - Quick & Easy to Install - Download App, Register, Add Plug, Enable "Smart Life"
Installing a remote control plug couldn't be easier. Each package comes with a guide + clear instructions. Download the "Smart Life" app on your mobile device (phone or tablet) to remotely/wirelessly operate the mini smart plug. Never again worry about forgetting. This no hub wifi plug can be programmed to turn off at the exact time you designate. ✅ COVERED BY 1 YEAR WARRANTY: We stand by our Smart Home Electronics, so we back them with a guarantee! You can't go wrong with a smart wifi plug. Use it for smart home fan control, light control & appliance control. Make the smart move - Do what you gotta do. 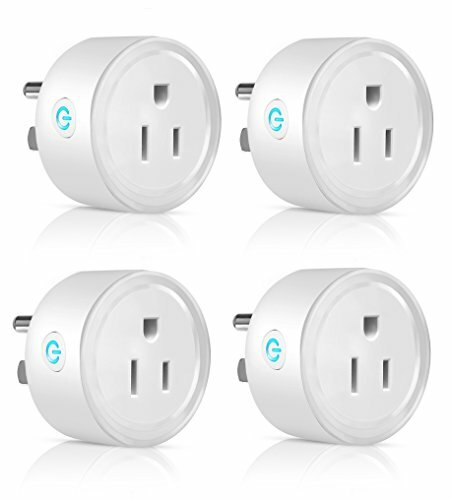 Click 'ADD TO CART' to order your Mini Smart Home Outlet Socket Plug! WIFI ENABLED ELECTRICAL OUTLET: Syncs to wifi - NO hub required! Installing our wifi plug outlet is incredibly easy. Simply plug it in & download the FREE wifi plug app to wirelessly control your power supply. REMOTELY CONTROL ELECTRONICS: Use the wifi plug socket to remotely control appliances such as lamps, fans, nightlights & more. Made out of flame resistant materials, the smart home plug is safer than others. FEATURES PROGRAMMABLE TIMER: Enhanced with a built-in timing function, the remote control smart plug can be programmed according to your schedule. Our smart home accessories complement your lifestyle! PEACE OF MIND ONE YR WARRANTY: This 2.4GHz wifi plug outlet socket is the trusted remote control electrical outlet. With confidence, we back our Alexa compatible smart plug with a one year peace of mind warranty. If you have any questions about this product by Heart Beat, contact us by completing and submitting the form below. If you are looking for a specif part number, please include it with your message.